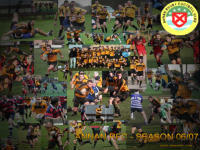 Here you shall find all the news, gossip and reports on the best rugby team ever to be called Annan Rugby Club. Annan run 3 senior teams (2 mens and 1 women's), as well as 9 youth teams (from P1 to U18, boys and girls). Craig McCann is Annan Rugby's Child Protection Officer. Tartan Touch is Back - 3rd May at Violetbank! Annan Rugby Club would like to thank all our sponsors for their continued support. I have noticed that sometimes this website seems to be a few days/matches behind current events. This website should always be up-to-date. Please clear your browser cache/browsing data if it appears that way to you. I am looking into fixing this problem..
Press Control and F5 to refresh website and get the latest news!. And as always - this website will one day (soon!) be brought up to the modern age (honest!) Its now 23 years old and looks it! The views on this page are my own and should in no way be construed as the views of Annan Rugby Club. Thanks for dropping by and I hope you enjoy your visit. If you would like to help or contribute in any way to this website then please contact us @ contact@annanrfc.com.